Each off-season players and parents feel the pressure to be involved with spring/summer hockey team programs, often in fear of being left behind if they do not participate. What’s important for players and parents to know is that, naturally, playing other sports during the spring/summer is best for athlete development and that you’re not left behind if you don’t participate with spring/summer teams. If choosing to participate in an ice hockey program during the spring/summer it is important to choose a program that is based around individual skills/tactics and not around competition. For nearly all ages the optimal off-season should include some on-ice skills/training but must also focus on rest, athletic development (another sport and/or off-ice traning), and fun. The goal of a practice in hockey is to improve. This improvement could be in diverse areas such as the speed of skating for a player in a breakaway, the skill needed to perform an accurate wrist shot, or the strength of a player trying to get puck control behind the goal. Trainability makes the link between the drills and activities completed during practice the improvements in performances in areas such as skills, stamina, speed, strength and suppleness that are needed to be successful during games. Trainability varies between different players. 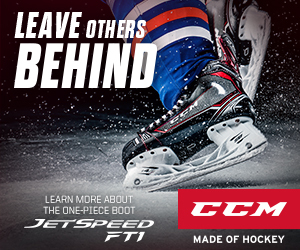 For example, a drill during a practice that has the goal of improving skating speed will increase the speed of some of the players but not all of them. The ones who do not respond as well may, in a few more speed drills, catch up in speed or even surpass the faster learning and improving players. Naturally, this is problematic for coaches as they have to now decide how to address these differences between players. The coaches can move at the pace set by the ‘fast trainers’ and have the slow trainers become discouraged or move at the pace of the slow trainers and have the rest become bored during practice. The differences in trainability are due to a number of factors. Genetics, developmental age (age with respect to Growth Spurt), diet and types of activities all change the trainability of an individual. One of the keys within the HC-LTPD is to encourage parents and coaches to use developmental age to maximize the trainability of players. For example, skills are best introduced and refined prior to the growth spurt. Delaying this will mean much more work further down the road when the player is attempting to play at higher levels. Trainability is highest during this period in a player’s development. Skills can include things like puck handling, shooting and passing, checking and most importantly skating. In addition, speed, which in this case means how fast a player can move their arms or legs, can also be considered a skill. 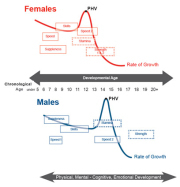 Speed in terms of, say, skating speed will increase with the growth in size and muscle mass which occurs normally during and following the growth spurt.